New legislation doubling penalties for using a mobile phone while driving, due to come into force on March 1, will be welcomed by people in the UK, according to a new poll. A Twitter poll of 2,149 people in the UK, carried out in February 2017 by National Accident Helpline, showed that 78% were in favour of an increase in penalties, while only 14% were against an increase. The remaining 8% said they weren’t sure. However, in response to the survey, many voiced their concerns that the new penalties were still not high enough. Almost one third (32%) said the revised penalties, at £200 and 6 licence points, ought to be even higher. Meanwhile, the company’s Google Survey of 2,000 drivers in the UK, also conducted in February 2017, revealed that almost a quarter (23%) admit to having used a hand-held phone while driving in the last 12 months. The survey revealed that using a phone while driving is still a widespread problem, in spite of recent police crackdowns and campaigning by organisations such as Brake and the RAC. The National Accident Helpline survey also revealed that people under 35 were 50% more likely to have used a phone while driving (30%), compared to those 35 and over (19%). The survey asked what people were using their phones for when driving. The most common reason was adjusting a maps app (10% of all respondents), followed by making or receiving a call (9%), texting (8%), browsing social media (5%) and checking or sending a work email (4%). Respondents aged 18-24 were twice as likely to have checked or sent a work email while driving (8%), compared to the average (4%). Almost 50% more men (27%) than women (19%) admitted to having used a phone while driving. In particular, men were twice as likely to have browsed social media (6%) than women (3%), or to have made or received a call while driving (11%) compared to women (7%). The group most likely to have used a phone while driving were men aged between 25 and 34, over a third of whom (37%) admitted to having used their mobile while driving in the last 12 months. They were three times more likely to have done so than women aged 55-64, only one in ten of whom (10%) had committed the offence. It is illegal to use a hand-held phone while driving, even when stuck in traffic. Drivers may only use a phone to call 999 or 112 in an emergency if it’s unsafe or impractical to stop, or if safely parked. From March 1 2017, penalties for using a mobile phone while driving will increase from a £100 fine to £200, and from three licence points to six. The National Accident Helpline studies were carried out to build on research from their Accident Awareness Week campaign in November, which highlighted the dangers of being distracted while out and about. According the Accident Awareness Week research, 46% of Brits have put themselves in danger because they’ve been distracted whilst walking or driving. The awareness campaign also uncovered the top tech-related reasons for people being distracted, including texting, talking on the phone and using a maps app. Our Accident Awareness Week campaign highlighted just how much we’re being distracted by technology when out and about. 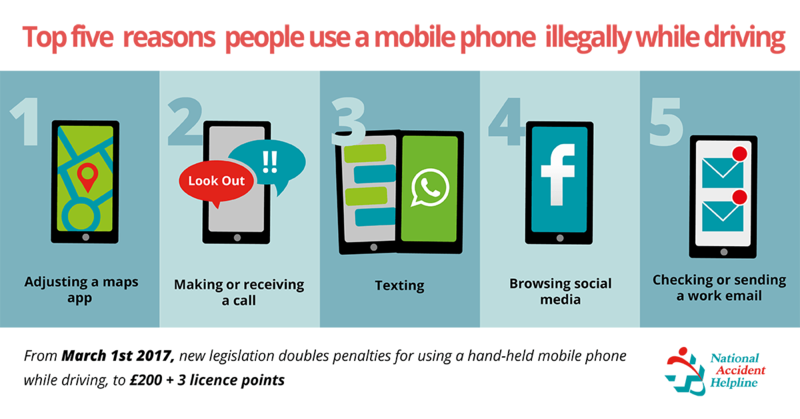 With the new legislation about to increase penalties for using a hand-held phone while driving, we wanted to highlight how much people in the UK are being distracted by technology while driving. We know that this is one of the main causes of accidents on the road, and we welcome any change in the law that improves road safety. We hope the increase in penalties will help to deter drivers from being tempted to use their phones at the wheel. For information about road accidents, including the main causes of road accidents and what you should do immediately after an accident happens, visit National Accident Helpline’s road accident advice page.